In July 2017, an email was circulated to scientists around the world. The email asked us to sign a paper giving the message to world leaders that things needed to change drastically, if humanity was to avoid widespread misery from environmental destruction. This email came from scientists at the College of Forestry, Oregon State University, who have formed a grouping called the Alliance of World Scientists. The paper was published in November 2017, in the journal BioScience. It follows up on progress after a similar statement was made by the Union of Concerned Scientists in 1992, the latter being signed by 1,700 senior scientists. This 2017 Warning to Humanity (‘the Warning’) was written by a group of pre-eminent academics, mostly ecologists. The 15,364 signatories to the publication come from 184 countries, with most signatories from the USA, then Brazil. Two-thirds come from the US, the EU and Australia. Since the article was published, another 4,000+ scientists have endorsed it. The Warning received widespread positive coverage in the media (e.g. CNN, Washington Post, even The Sun and the Daily Mail), and subsequently from campaign groups such as Avaaz. This coverage particularly highlighted the very large number of scientists endorsing the Warning as evidence of its importance. After some deliberation, and independently, the three of us decided not to join the scientists who either originally signed or subsequently endorsed the Warning. We know that others too decided not to sign, but there has been little discussion of why that might have been. Here we outline our reasons. 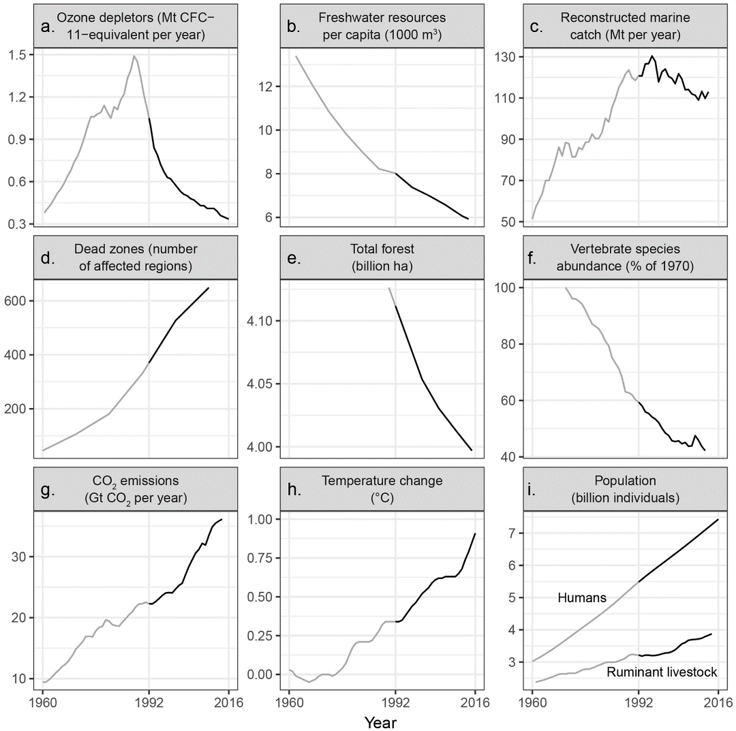 Whilst we hugely respect the authors as scientists, and do not disagree with the technical contents of the paper (the environmental trends they point to are captured in Figure 1, and listed at the foot of this article), we do fundamentally disagree with the ethos of the exercise and the tone of the message. As a result, we have doubts about the Warning’s effectiveness in galvanising the change we need. We also challenge any implication that the paper represents a unanimous call-to-arms from global scientists. Firstly, the ethos. A small group of leading professors wrote an analysis of environmental trends, accompanied by a set of prescriptions for action to mitigate our damaging impact on the planet. This was then circulated amongst senior academics to sign, followed by the scientific community at large. The article was published in a scientific journal. We would argue that this rather top-down approach is not the way to build a broad and inclusive consensus behind an analysis of biodiversity loss, and to prescribe practicable solutions that solve this important ongoing sustainability challenge. Crucially, the proposed solutions (also listed at the foot of this article) say virtually nothing about poor people, how they might be affected by biodiversity loss, and how responses to that loss could affect them. The focus on approaches such as expanding protected areas, divestment in environmentally damaging investments, reducing meat consumption and food waste, and rewilding – whilst certainly likely to be effective from an ecological point of view – represent a very ‘Western’ take on ideal solutions. International scientists need to embrace a wider range of different, locally relevant and inclusively generated, solutions, if they are to appeal to and work alongside many of those living in poorer or less industrialised parts of the world. Second, the tone. It is well recognised in the health and psychology literature that the framing of messages is an important component of effective behaviour change. In particular, there is increasing support among conservationists for the idea that the path towards real and lasting change is not via negativity, but through optimism and hope. This is expressed by the connected Ocean Optimism, Earth Optimism and Conservation Optimism movements. We feel that positive messages of hope and empowerment are more effective at engaging the general public, combatting despair and powerlessness, and thereby building a coalition for change. If we as scientists appear to stand apart – and to castigate the rest of the world for ignoring us, whilst issuing periodic dire warnings of Armageddon – we cannot expect either the public, businesses or legislators to listen to our prescriptions. But even putting aside considerations about the packaging and tone of the message we scientists send, the technical research gives us many reasons to be positive. Species have been brought back from the brink of extinction and ecosystems have been protected. 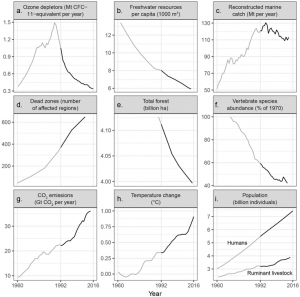 Human impacts on terrestrial systems have grown less quickly than the global human population or the world economy in recent decades (although they are still growing). Governments are coming together to agree on action, including through the Sustainable Development Goals and the Paris Climate Agreement. Whilst we would never advocate being complacent, there are solid reasons to be hopeful. 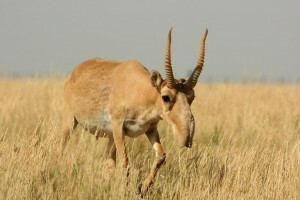 A saiga antelope Saiga tatarica. Despite the species still being listed as Critically Endangered on the IUCN Red List, over the last 15 years governments, conservation organisations and academics have worked together to increase the population five-fold. Credit: N J Singh. Third, the numbers game. Whilst the number of signatories to this Warning is deeply impressive, obtaining a list in this way is problematic. In the age of the internet, and easy endorsement of all manner of messages (Donald Trump’s most popular tweets have over 200,000 likes), it is possible to obtain many thousands of signatories for petitions covering any number of topics: see change.org for examples. In this context, it is hard to gauge the true resonance of the Warning among scientists. Ripple et al.’s website does not have a facility for capturing the number of scientists who, like us, actively elected not to sign the manuscript and their reasons for doing so. This would be the true test of how representative the Warning is of the thinking of the global scientific community. Aside from this, the number of scientists that believe in or advocate something should be secondary to the evidence which underpins the arguments being put forward. What makes the scientific consensus around the reality of climate change so impressive is that it is based on clear and well-researched facts, not that it is so dominant. Many countries are not well represented in the signatory list. For example, three scientists from Uzbekistan (home to over 30 million people) signed the Warning, while only one person based in Kyrgyzstan (in a university offering US-accredited degrees) signed. 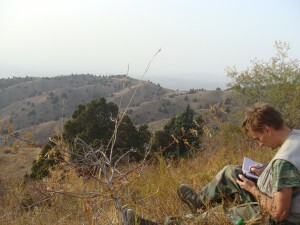 Photo: an Uzbek researcher carrying out invertebrate monitoring on the edge of a national park, overlooking upland pastures, near the Uzbek/Kyrgyz border. Credit: J W Bull. We are also concerned that the existence of a manuscript with so many scientific signatories in a high profile journal immediately lends an air of unanimity to the message, almost suggesting it is unchallengeable – which can then be mobilised inappropriately by campaign and advocacy groups. Whilst not wishing to criticize the authors or signatories themselves for such a result, this is nonetheless perhaps an inevitable outcome of playing the numbers game. For example, the ‘Half Earth’ proposal is extremely controversial amongst conservation social scientists, but Avaaz used the Warning as a hook to fundraise for this idea. Do those 15,364 scientists all think that setting aside half the Earth purely for nature conservation is the way forward? We very much doubt it. Make no mistake – the science is clear on that fact that global biodiversity is declining fast. We absolutely need to do something about it, and on that we fully agree with Ripple et al., and their co-signatories. But the answer is not to push the panic button at 25 year intervals: rather, it is to be optimistic, work hard on solutions from the ground up, in collaboration with as wide a variety of sectors and interest groups as possible, put people (and especially the world’s poorest people) at the centre of our efforts, and loudly celebrate successes when we achieve them. i) increasing abundance of ruminant livestock and people (note: these figures not incorporated into (f) above). 13. estimating a scientifically defensible, sustainable human population size for the long term while rallying nations and leaders to support that vital goal.